Last year, the Focus got a complete, from the ground up redesign for which it received much praise. With an improved cabin, many new cutting-edge features and increased fuel economy, the Focus shot back up to the top of its class. Over a decade since its introduction, the newest generation of the Focus proves that it can compete in an ever growing class. 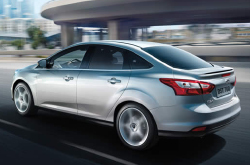 This year, the 2013 model continues on the same track as the redesigned 2012 Focus. Edmunds.com said its "one of the best small cars you can buy" and both the sedan and hatchback models consistently rank near the very top of their segments. For 2013, the Focus has received a few minor tweaks that have further improved the already popular car. If you've been thinking about purchasing the new Ford Focus in Phoenix, visit Peoria Ford to find out why this affordable small car receives praise by critics and owners alike. Below is a full review of the Focus, where you'll find information about the sedan and hatchback's trims, amenities, safety features, power ratings and much more. Simply scroll down past the video to learn about this award-winning Top Safety Pick. When comparing the 2013 Ford Focus alongside the 2013 Honda Civic, Hyundai Elantra, Chevrolet Cruze and the Mazda 3, and you'll realize that the Focus wins over those autos in oodles aspects. Look through just a few of the reasons below. Don't go to a megacorp car repair shop in Phoenix when Peoria Ford's exceptional Focus experts are only a short jaunt away from home. We also throw in a gratis warranty on our work - more than most megacorp shops do. The professionals at our AZ Ford service center can be trusted to keep your Focus in tiptop form for years to come. We handle big, intricate services like muffler repair, as well as manageable undertakings such as quick oil changes, brake pad replacement and a wide range of special services. It's very simple - to get honest prices and professionals Ford repairs, Peoria Ford should be your first choice when deciding on a Phoenix auto center. See the link under this text? That's your road to savings! Now run along and click to see wallet-friendly coupon specials. If you're searching for a car with tons of advanced, high-tech options; a refined, library quiet ride; and impressive fuel economy ratings, visit Peoria Ford to test drive the 2013 Ford Focus near Phoenix today. Now that you've had a chance to learn a little more about this popular small car, it's time to put it to the test and see if it truly suits your lifestyle. Come down for a test drive and check out a variety of Focus sedans and hatchbacks. Available in several cool colors and with several options to choose from, you're sure to find the right Focus for your needs. Peoria Ford is also the place to go if you want to get the best deal possible on your next new car. Dealership specials and incentives that come straight from the manufacturer are always at your fingertips when you visit Peoria Ford. Your sales associate can go over all of the deals available to you at the time of your visit, and if you wish to be notified about deals and dealership news, you may also connect with Peoria Ford on Facebook and Twitter.